Shuttle managers have begun evaluations into STS-335, the LON (Launch On Need) mission in support of STS-133 – currently the final flight on the shuttle manifest. 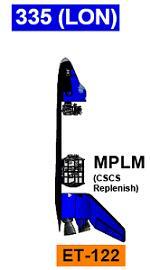 The rescue flight would carry a MPLM (Multi-Purpose Logistics Module) to replenish the Station for hosting the STS-133 crew for up to several months. Meanwhile, managers are also favoring a Californian landing for STS-133, thus allowing for a cross country farewell tour back to KSC. 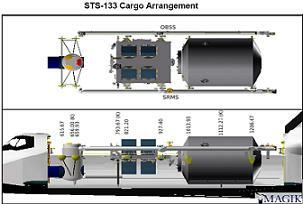 STS-133 is manifested as the final shuttle mission on the current schedule, carrying ELC 4 (EXPRESS Logistics Carrier), along with the Permanent Logistics Module (PLM) that will remain on the International Space Station (ISS). With a launch date of September 16, 2010, Discovery’s 39th flight of her career will utilize External Tank ET-138 for a 10+1 day mission that will include one EVA. Evaluations have also begun on targeting the Edwards Air Force Base – home of the Dryden Flight Research Center – as the primary landing site, allowing for a cross-country farewell tour of the NASA centers on top of the Shuttle Carrier Aircraft (SCA). Only a couple of subsequent Spacelab missions have previously utilized Edwards/Dryden as the primary landing site, namely STS-50 – which eventually landed at KSC – and STS-58. The now confirmed switch of STS-133 to the final mission places STS-134’s mission with Alpha Magnetic Spectrometer (AMS) on a July 29 launch date with Endeavour – although this remains subject to change based on the critical path of delivery AMS to the Kennedy Space Center on time, due a problem experienced by the payload earlier in the year. “The AMS magnet system experienced a problem in May. The fix to this has been implemented and the magnet will be welded closed on September 17, 2009. This means that the magnet will not be ready to test again until early November,” added the AMS manager on a recent Program Requirements Control Board presentation on L2. “It is hard to predict an exact date due to uncertainty in the cryogenic operations that have only been performed one time. Engineering is concur on an STS-134 launch date of July 29, 2010 as long as this magnet testing is successful. “Every effort has been made to ensure that the fix that the AMS collaboration implemented is sound, but there is a possibility that this test will have some issues that will require additional schedule to fix. AMS must be delivered to KSC by March 28 to make a July 29, 2010 launch date. “The KSC schedule has 2 weeks of slack. The AMS schedule to get to KSC has 2 weeks of slack. It would be better if the Shuttle Program could wait to make a final decision until after the AMS magnet testing is complete. With Discovery providing the LON role for STS-134, managers evaluated as to how they could support the final mission via the rescue requirement, given the lack of a “next flight” on the concluding shuttle manifest. Their decision was to add STS-335 (STS-135 LON). This flight would be carried out by Atlantis, on a schedule that would support the rescue of the STS-133 crew by targeting a launch for December 15, 2010. During the planning phase, and approved at the PRCB, managers decided that Atlantis would launch with the refurbished ET-122 – a tank that was damaged when Hurricane Katrina at the Michoud Assembly Facility (MAF), and is currently under repair at the New Orleans facility. “ET-122: This tank is in Building 420. The mechanical doubler repair to the intertank is complete. Some minor gouges are being worked on the stringers,” noted the latest status report for ET-122. MAF have two spare tanks, though the other (ET-94) is not a “Super” Light Weight Tank and would require modifications, along with two completed aft domes and one intertank (ET-139 and ET-140 – renamed from ET-140 and ET-141) in reserve – parts that were built to the point they could be completed with the new friction weld machinery set up for Ares. These tanks would be completed in the event of a shuttle extension, providing for STS-136 and STS-137. SMRT presentations acquired by L2 document the spare tank stock at MAF, which would provide a buffer zone for a 2015 extension that would require several new tanks to be built. Interestingly, the spare tank stock was not communicated to the Augustine Commission, who are under the impression there is no spare tank hardware at MAF past ET-122 – following a request for information made to MAF’s “NASA Center” MSFC (Marshall Space Flight Center) who are heavily opposed to shuttle extension via a protective attitude towards Ares. The availability for “extra flight” hardware would actually be available as soon as November 29 if required, with the boosters available as soon as May, 2010. “STS-335 hardware: All projects will have hardware in flow to support a Nov 29th rescue of STS-133. 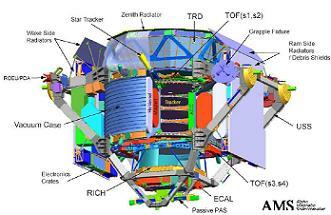 ET will be at MAF until (Decision Date) on 9/30/2009,” added a PRCB presentation on L2 specific to STS-335. With a smaller crew than usual flying on STS-133, and a plan to return some of crew members via a Russian Soyuz, the remainder of the crew would be able to stay on the ISS for at least 120 days, meaning STS-335 would not actually need to launch until February 23, 2011. This timeline is based on what is called the Contingency Shuttle Crew Support (CSCS) timeline, which is continually refined based on consumables on Station. CSCS also covers the procedures the crew would need to carry out with the damaged orbiter, which includes the unmanned undocking and tail first disposal during a destructive re-entry. “CSCS capability will be higher than recent flights (STS-133 crew helps even more). Projected CSCS with a immediate return of one Soyuz is at least 120 days. On orbit crew size would be nine. STS-335 LON Launch ‘Need Date’ = 2/23/2011 (STS-133 launch date + 120 days). Analysis and specific LON OPS will be completed by L-1 month of STS-133 launch STS-335 OPS,” added the PRCB presentation. One recent addition to the STS-335 plans is to include a MPLM to the flight, which would be the first time a rescue mission would carry an actual payload. The reason behind this is to allow for the rescue mission to “restock” the ISS, following a drain on its consumables via hosting the increased crew size. However, this also allows for an opening cycle of evaluations aimed at turning STS-335 into STS-135. 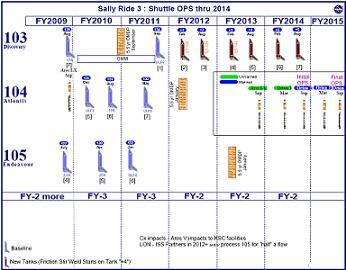 Adding another mission would only come via additional funding – most likely through approval to extend the shuttle manifest – though sources note at least one meeting has taken place, relating to STS-135 as an actual mission, within the past few weeks. That September 21 meeting evaluated a crew of four or five launching on a heavy logistics mission – again with a MPLM – aiding the Station’s desperate need for supplies, which once again emphasizes the problems with extending the ISS to 2020, without the support of the shuttle’s unrivalled upmass – and indeed downmass – abilities. While a one flight extension to the current manifest is possible – and was even discussed as an option during the opening round of extension talks – the Augustine Commission’s main option is to extend the manifest to FY 2015 (2014) – as classed as Sally Ride Option 3 on Augustine Commission documentation on L2. However, a decision needs to come soon, with shuttle related layoffs occurring at an increased pace of late, with the remainder of the workforce suffering continued impacts to their morale via badly timed and poorly worded addresses via management, one such example coming on Monday when it was intimated – but not confirmed – that United Space Alliance workers that are set to be released at some point next year will be on a pay freeze until that time. While that may not be a reality, the continued attitude of some managers, who may wish for extension but dare not harm their careers by going against the party line of “shuttle retiring in 2010 come what may”, is often cited by large numbers of shuttle workers as the most demoralizing element of what remains a superb program. Thanks to the high levels of dedication and professionalism by the shuttle workforce, the remaining six missions on the current manifest will have all the support they need, even if a large number of workers have no idea if they should be spending time searching for new careers in order to pay their mortgages past next year, due to the continued uncertainty surrounding the end date for the Shuttle Program.